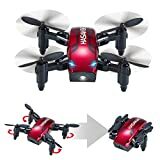 · Take off and Landing a click ： The drone is equipped with a take-off and landing key, which makes the drone easier to fly by players.from any level. · Headless Mode ： The orientation of the drone will remain constant so it is easier to control it without having to find out which side the front is on. · HIGH / MEDI/LOW SPEED ： Low speed for beginners, high for experienced aviators. Makes your flight easier and safer.